Hershey Chocolate Company included specially sized postcards with their 5 cent milk chocolate bars from 1909-1918. Over the years of production, 3 styles of printing were used: black and white, green and black and 4-color. 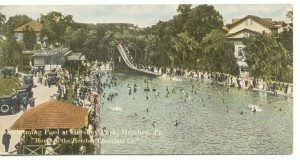 Postcard features scene from Hershey Park, ca1916-1918. 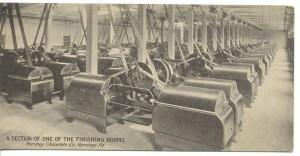 Early "Bar cards" featured scenes of chocolate making departments such as the Longitude or Conche department where chocolate was mixed for up to 96 hours before being moulded into bars.